The Hypercom ICE (Interactive Consumer Environment) 5500 Point of Sale terminal is easy to use and has an integrated interactive touch-screen. 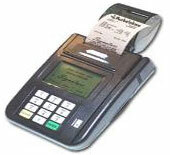 ICE 5500 also has an integrated thermal printer and integrated PIN Pad. Retail and Restaurant applications have been Class A certified on the Vital platform for this unit. Designed as a single, integrated unit, the ICE 5500 brings touch-screen, graphic display technology to the POS.